Mr Desert Streak, under jockey Luis Vivanco, drives to victory in the $30,000 Races and Aces Stakes on Saturday night at Evangeline Downs. 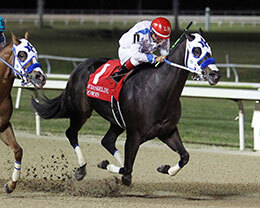 OPELOUSAS, LA—NOVEMBER 3, 2018—Mr Desert Streak drew the inside post position in the field of five for the $30,000 Races and Aces Stakes on Saturday night at Evangeline Downs and that was an overwhelming factor in his first career stakes victory. The 4-year-old gelding took the lead immediately from that inside post and established some distance between himself and his rivals as the field moved through the turn. That cushion proved invaluable as the 1-5 betting favorite, Louisiana Dressblues, bore down on the leader through the stretch, but his rally came up a neck short at the end. Mr. Desert Streak covered the 870-yard distance in a final time of 46.567 seconds over the fast track, equaling a speed index of 88. Mr. Desert Streak was sent off by the betting public at odds of 11-1 and returned $25.20 to win, $3.80 to place and $2.40 to show. Louisiana Dressblues paid $2.20 to place and $2.10 to show. I’m Mighty Fast was last early on, but closed well to get third and paid $3.20 to show. Mr. Desert Streak was bred in Louisiana by Gene Terry Glessner, is trained by Trey Ellis and was ridden to victory by Luis Vivanco. The 4-year-old gelding is by First Down Mr. Jess and is out of the Wall Streak mare, Miss Desert Streak. Out of the Wall Streak mare Miss Desert Streak, he has now won five of 17 career starts and the $18,000 first-place purse increases his lifetime earnings to $79,395. Runner-up Louisiana Dressblues races for owner Wilson One Consulting LLC. Jockey Donell Blake had the riding call aboard the Jess Louisiana Blue 3-year-old for trainer Trey Ellis. Bred by Easy Acres Performance Horses, from the Meadowlake thoroughbred daughter Charlomaine, Louisiana Dressblues earned $6,000 to bring his bankroll to $62,760. Jesus Garrido saddled third-place finisher Im Mighty Fast for owner Triple C Racing Stables, LLC. Gerardo Garrido rode the Mighty Corona gelding out of Sheza Fast Doll by Beat The Feet (TB). Bred by Brent Cody Leblanc, the multiple stakes winner of over $161,000 earned $3,300 for the effort. Jw Who Dat and B And G Fast Dash completed the field. Geaux Dashin Bye and No Politics Here were scratched.